Place parsley (stems and all), garlic, oregano, red pepper flakes, and salt in a food processor and pulse until the mixture is finely ground. Add red wine vinegar and pulse briefly to mix. Scrape the mixture into a bowl and pour over olive oil. Let sit at least 20 minutes, then serve. 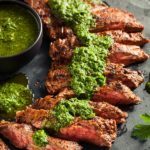 This chimichurri sauce may be made up to one day ahead.